Subscribe to The Historical Review of Berks County! Is this Subscription a Gift? If yes, who is the gift for? by john M. Lawlor Jr. The history of the Civil War is very complicated at all levels of inquiry-national, state and local. It is a multi-faceted subject involving interacting social, economic, political and military factors. No area of Civil War study emphasizes the complexity of this conflict better than the issue of conscription. Indeed, this topic is much too broad and intricate for a detailed analysis in this paper. What this article proposes is an examination of a significant local primary source, the “Historical Report” of the Provost Marshal. This report explains the problems encountered in Berks County with the implementation of the Federal drafts. It yields considerable in formation about the response of Berks County to the military needs of the country during the war. Conscription during the Civil War was a new experience for the country and one that was universally disliked. Opposition ranged from overt resistance such as draft riots in New York City and murders of enrolling officers in numerous areas to more subtle individuals acting out in defiance by failing to enroll (register), fraudulently obtaining an exemption, deserting, or seeking refuge in “safe” areas of the states or escaping to Canada. Draft resistance in the North demonstrated the increasing unpopularity of the war as did the necessity of a draft itself. This unpopularity stemmed from both the failure of the Lincoln administration to subdue the rebellion quickly and the prospects of a social revolution which emancipation of the slaves implied. The first Northern Civil War draft, which coincided with the 1862 Congressional elections, was held under state auspices. Each state was given a manpower quote based on population. The states’ drafts simply failed to muster the necessary troops as resistance began stiffening in response to casualties and changing war objectives. Due to the failure of the Democratic Party in the fall elections, Congress passed national conscription legislation in March, 1863. The Federal legislation was extremely controversial. The most galling provision, as far as Democratic partisans were concerned, was the three hundred dollar commutation clause. Commutation meant that a person who paid the Federal Government $300 was relieved from military obligation. Democrats condemned this provision because they felt it discriminated against the poor. Also provided for in the legislation was the creation of an enforcement arm – the Provost Marshal General Bureau within the War Dept. The Federal Government now had direct access to potential recruits through compulsion, if necessary. Organization of the Provost Marshal General’s Bureau took several months. Gradually, under the direction of Provost Marshal General James E. Fry, the apparatus for enforcing the draft developed. Each congressional district was assigned a provost marshal whose responsibilities included establishing an enrollment office, enrolling draft eligible males, arranging and executing the draft lottery, and making certain that draftees reported for military service. Once these duties were per formed, the provost marshal was to see that deserters were arrested and appropriately disposed of by either imprisonment or reentry into the military. The Federal draft system in Pennsylvania was not too different from that established by Gov. Andrew Curtin in 1862 when the draft was under state control. Even some of the personnel remained the same. Henry S. Kupp, the first of three provost marshals assigned to Berks County, had held a similar post in the state draft in the fall of 1862. Being the provost marshal in Berks County, as elsewhere in the north, was not an enviable position. Political circumstances in Berks made the job even more odious. Berks was a heavily Democratic county. Democratic partisanship was extreme in Berks and the Democrats won election after election by consistently wide margins during the war. They ran on intensely anti-Republican platforms. Berks was labeled the “Eldorado of the Democracy” by Republican State Senator Morrow B. Lowry, of Erie County, because of its staunch opposition to Republican war policies. 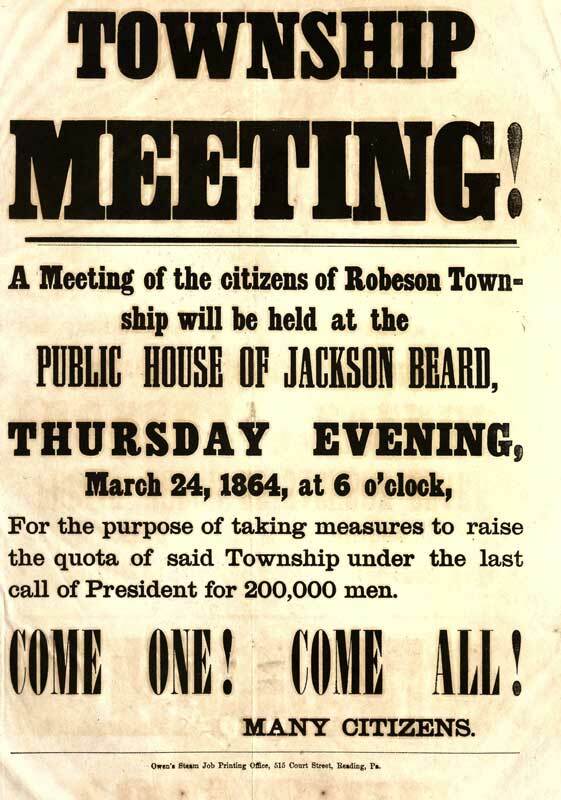 Berks Democrats opposed the suspension of the writ of habeas corpus, rejected the abolition of slavery, denounced conscription, criticized the Administration’s war methods, fought all measures aimed at social or political equality for free Blacks, and carried their partisanship proudly. They considered themselves unionists but believed that a negotiated settlement with the South was preferrable to military victory. They demanded reunion with the South based upon the “status quo ante bellum.” Nothing else would do. Berks County Democrats were very outspoken on the issues, United States Congressman Sydenham Elnathan Ancona and State Senator Hiester Clymer from Berks County were consistently in the vanguard of Democratic opposition to the Lincoln Administration. Ancona, who rarely spoke on the House floor, offered what was tantamount to an ultimatum to the Administration in that forum. He demanded that the Emancipation Proclamation be rescinded and urged that the conscription legislation be withdrawn. Failure to do so, he warned, would forfeit any further Democratic support for the war. On the stump, Ancona denounced abolition and the draft in no uncertain terms. Clymer, a brillant state senator and leader of the Democratic side of the aisle at Harrisburg, was an articulate and forceful advocate of the Democratic Party Line. The Democratic press in Berks County was also a prime instrument for the dissemination of anti war, anti-Republican rhetoric.). Lawrence Getz, a key local political leader and editor of the influential Reading “Gazette and Democrat” contributed heavily to the Democratic atmosphere in Berks. It was to this climate that the provost marshal had to function. Hostility to the draft had to be expected. Prior to the establishment of the provost marshal’s office, trouble had broken out. Tempers flared in December, 1862, over the shooting of a deserter. In March, 1863, two months before the opening of the local provost marshal’s office, a demonstration had occurred in Reading, the county seat. This protest was primarily in response to the impending Federal draft. Weak, if not comical, the protest had little effect. Blame for the disturbance fell upon the “Knights of the Golden Circle,” a secret subversive group. This group however, was never a true force in local draft resistance, and the Democratic Party denounced it. In such a strong Democratic county as Berks, the “Knights” were an embarrassment and. a liability to the Party. The Democrats were strict legalists: covert and illegal actions, they felt, were simply unnecessary and actually counterproductive in Berks. At a mass meeting, the Democratic leadership rejected all secret societies and held up the Republicans’ “Loyal League” for particular scorn. In the opinion of the Democrats, propaganda for the Republican press, the “Berks and Schuylkill Journal,” would be the only outcome of the “Knights” misbehavior. They took great pains to disassociate themselves from the “Knights.” Very quickly the “Knights”, disbanded and played no further role in Berks County draft resistance. At least the provost marshal would not have to contend with covert organized opposition. Details of the tenures of the provost marshals in Berks County were recorded in the “Historical Report” for the Eighth District of Pennsylvania which was written on June 3,1865, in response to a request from Provost Marshal General Fry. Fry wanted to know the problems encountered by the local provost marshals in the execution of their duties. Captain George W. Durrell, the last of three provost marshals to serve in Berks County, signed the report which his office clerks compiled. Having served only ten months, Durrell relied upon office records and personnel to report on the functioning of the office. Records, however, are still available to collaborate his report. Each step of the draft in Berks County was outlined in the report, and problems abounded. The first difficulty was securing enrolling officers. These men were charged with taking an accurate census or enrollment of all those eligible for the draft. The pay was poor; the job potentially hazardous. Few were willing to apply for the positions, and it was only with coercion from board employees that enough enrollment officers were hired. The atmosphere in Berks made the position very undesirable. In the light of the above, the caliber of the enrolling officers was very poor, as was the quality of their work. Reasons for this were clearly spelled out in the report. The draft district (Berks County) had been subdivided along township and ward lines. The enrolling officer rarely lived in the sub-district in which he was to take an accurate count. Unfamiliar with the people they were to count, the enrolling officers were easily duped. Furthermore, Durrell complained, many of these officers were illiterate they could not even spell the names of those they were enrolling. In addition to these problems, fictitious names were registered on the lists of the enrolling officers as a result of outright pranks. Taverns and inns were major sources of names and often the clientele gave the officers bogus names to enroll. These names were never purged from the lists even though correct names were added. This, of course, inflated the enrollment and resulted in quotas being higher than they should have been. Ironically, the very people who most opposed the draft caused the burden on their communities to be heavier due to the higher quota. Durrell estimated that in excess of 1,000 names had been erroneously listed. He suggested that the local “Post Master” or the “Internal Revenue Assessor” be forced to serve as permanent enrolling officers so the accuracy of the list could be assured. Specific instances were rare. One such case involved Oliver Bechtel, an enrolling officer, who was attempting to enroll Samuel Reinert. Bechtel was doused with hot water by Reinert’s wife, bitten by Reinert’s dog (which he then shot dead), and finally chased at gun point by Reinert. The local Democratic Party, however, disapproved of any form of violence. Means to peacefully and legally resist the draft were readily available. After lengthy suggestions on procedural modifications to im prove enrollment, the “Historical Report” step-by-step explained the process of the draft. The technicalities shown in the report illustrate the serious attention paid to fairness in the actual lottery. A bi-partisan committee of prominent citizens supervised the drawing in full public view. Influential Democrats such as Congressman Ancona, State Senator Clymer, and County District Attorney Daniel Ermentrout, reassured their constituents by their attendance that the results of the draft were honest. Jacob Knabb, Republican watchdog and editor of the “Berks and Schuylkill Journal,” reassured Republicans that the Democrats had not practiced any chicanery. The actual drawing of names, as pointed out by numerous local historians, was performed by a “blindfolded” blind man. This action complied with the directive from the Provost Marshal General’s Bureau that the drawer be blindfolded. After the drawing, the names of those selected were published in the local press. Legal notice was then served individually, but notice servers were very difficult to hire. Each of the four Federal drafts rigidly followed this format. A summary of the figures for the four Federal drafts suggests the complexity of the Federal draft process. The quota for Berks County was 8,245 men. Of this number 5,494 men enlisted either as substitutes or recruits in lieu of the draft. This left a deficit of 2,751 men. In order to raise this number, three of the four drafts were inflated by as much as 100%. By doing this, 4,548 names were drawn to cover the 2,751 men deficiency. This was done in expectation of large numbers of exemptions. Exemptions equaled 1,839, substitutes secured after the drawings amounted to 821, and commutations secured after the drawings amounted to 404. Quite a few men failed to answer the draft call (310), but many of these probably represented fictitious names. A total of 974 were excused from duty because quotas had been filled. Of them (the 974 discharges), 969 were released after the final draft call when the out come of the war was no longer in doubt. Only 200 Berks Countians were actually inducted into the army as a result of the drafts. Out of a total of 4,548 names drawn from the draft wheel, 200 were all that were actually drafted. The processing of these draftees was rather straight-forward. Draftees were notified when to appear at the Provost Marshal’s Office for examination. At that time they could apply for exemption. Those who were accepted for military service were placed under guard to prevent their escape, sent to the “Rest” on Seventh Street, and confined there until sent to Philadelphia. Special agents accompanied these men to Philadelphia where they were formally mustered into the service. Each draftee was credited to the sub district in which he resided. Again, only 200 Berks Countians actually under-went this ordeal. Why so few out of such a large number were compelled to serve is an interesting question. Part of the answer lies in a peculiar feature of the Civil War drafts which permitted substitutes to take the places of draftees. Here was a legal means to avoid the draft. A total of 821 draftees took advantage of this provision in Berks County. The price of a substitute was less than $300 until December, 1864. The price rose after commutation was eliminated. The military value of draftees and substitutes was suspect. Captain Durrell challenged their effectiveness as a fighting force. He stated that “the Drafted (sic) men held for service and the substitutes for drafted men accepted, were very unwilling and inferior soldiers and very few of the latter…ever rendered much service to the government.” Durrell strongly recommended an all-volunteer army. A major reason for Durrell’s skepticism was the corrupting influence of money on the system. Legal forms of resistance to the draft were the procurement of substitutes and the offering of large bounties to get recruits to enlist from outside the county and have these recruits credited to the county’s quota. 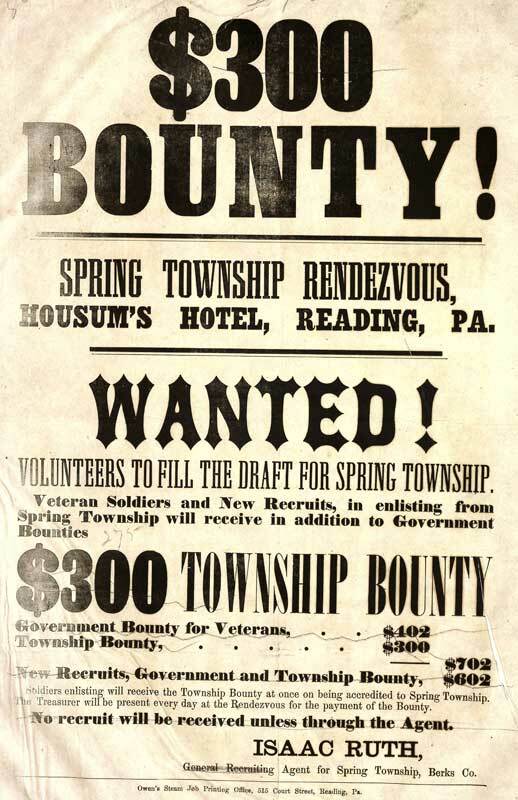 Bounties were enticements or bonuses offered by federal, state and local governments to spur on enlistments. This replaced patriotism with greed as the motive for an over whelming number of enlistees. The system encouraged bounty jumpers to collect a bounty from one community, desert, and then take a bounty from another community. Raising bounty funds was clearly an activity aimed at eliminating the need for a draft. If a sub district could raise enough volunteers by means of bounties, get enough substitutes, and/or buy enough commutations, it would be spared the stigma of a draft. In many cases intentions were good, but the direct result of the system was corruption unprecedented overall in the Nation’s experience. The bounty system also helps to explain why so few were actually forced into the service through the draft in Berks County. Democratic organizations, for example, raised funds so that local residents would not be drafted. This activity, however, was not confined to Democrats alone. Republicans, too, had bounty committees. These groups were extremely successful. Not only were few Berks Countians drafted, but most of the recruits credited to the county were not residents of Berks. “Seven Eighths (sic) of the volunteers enlisted to the credit of this district, Berks County, were obtained at, and mustered into the service at points outside the district, generally at Harrisburg and Philadelphia,” the provost marshal reported. The large number of recruits secured outside Berks County was another serious problem for the provost marshal’s office. Red tape and delays in forwarding the credits to Berks led to fear on the part of the individuals and bounty committees that men recruited in Harrisburg or elsewhere would not be credited in time to prevent local citizens from being mustered into the military. The local office was continuously besieged by those who were inquiring about their status. Durrell described these problems with the tone of a frustrated and harrassed civil servant trying to function effectively in a system that was basically inefficient and corrupt. He saw the system as insensitive, unfair, and incapable of providing an effective fighting force for the Union Army. The final segment of the “Historical Report” concerned the problem of desertion. Procedures were outlined explaining how deserters were identified, arrested, and disposed of by the provost marshal. Special agents were hired to arrest deserters, and civilians were encouraged to help them make arrests. Again the problem of red tape surfaced. Civilians were paid for their services by voucher, but often these vouchers had to be sold by the recipients to brokers at a discount. In short, the vouchers were not easily turned into cash except at a loss. Community cooperation, therefor, was minimal. Only 197 deserters were arrested in Berks during the tenure of the provost marshal’s office. Concluding his “Report,” Captain Durrell blamed the federal draft system for the inability of the government to raise quality troops. He urged that a new plan be executed -one having more closely followed methods of raising troops which existed earlier in the war. … Whenever men are needed authority should be given certain persons (who should be approved by competent authority) to organize companies for the service. The usual necessary expenses of office rent, music and a few dollars hand money for each recruit to be paid to the Recruiting Officer, in addition to his salary. This plan would secure good and efficient men, and would avoid the necessity of a draft. Many Companies have been organized in this District, in the above manner by per sons who received authority from the Governor of Penna. (sic) and the men so obtained were vastily superior to those procured by the draft. Durrell was only partially correct in his assessment. Berks County had indeed responded to Governor Curtin’s calls for troops in 1861, 1862 and 1863. Berks was the first to field units in reaction to President Lincoln’s April 1861 call for troops. Durrell, himself, had commanded an independent artillery battery under the circumstances he described. Enlistments, though, had sagged by the summer of 1862. By this time only direct state defense in times of clear and present danger could raise large numbers of men. This was the case in the fall of 1862 when Chambersburg was captured by Confederate cavalry under J.E.B Stuart, in the summer of 1863 when the heartland of Pennsylvania was imperiled as Confederate forces under General Lee advanced towards Harrisburg, and, again, in 1864 when Chambersburg was burned to the ground. In each of these cases, however, local defense received top priority from civic leaders. Few Democrats in a heavily Democratic County were interested in crossing the state line to subject the South militarily to policies which they found socially, economically and politically repugnant. Local wealth played a significant role in the ability of Berks Countians to avoid the draft successfully. The legal monetary safety valves absorbed energy which in less wealthy communities expressed itself in violence. Yet, despite general war opposition in Berks and resistance to the draft, Berks did send thousands of residents to fight in the Civil War, many of whom served heroically. This fact cannot negate the impact of the Democratic Party in Berks, as proven by the failure of the county to meet its quotas through local enlistments. The party was an effective force behind the tremendous success of Berks in avoiding the draft. Durrell, however, made no mention of this fact. Captain Durrell’s “Historical Report” is a unique source for Berks County Civil War history because of its absence of politics and polemics. He described objectively and dispassionately the problems his office encountered. There can be no doubt that he criticized the system, often naively, but his criticism was aimed almost exclusively at the mechanics of the system. In an era of extremely vicious local political partisanship, Durrell and his predecessors in the provost marshal’s office maintained a high degree of impartiality. Without this attribute in their administration of the draft, Berks County might well have exploded in violence.